The theft deterrent system can be set by locking the doors using the transmitter or key, or by opening and closing the doors (for details, refer to Active Arming Mode or Passive Arming Mode). The alarm function will be activated when someone attempts to forcibly unlock any of the doors or open any of the doors, engine hood and back door while the system is in the armed state. In the alarm sounding state, the system illuminates the interior light and blinks the hazard warning lights, the headlights and taillights. At the same time, the system sounds the vehicle horns and security horn to deter break-in and theft as well as to warn people around the vehicle. The alarm can be canceled by unlocking the doors using the transmitter or key. There are two arming modes for this system: active arming mode and passive arming mode. When the active arming mode has been set, the theft deterrent system will be set after the user locks the doors via the transmitter or key. When the passive arming mode has been set, the theft deterrent system will be set after the key is removed and the driver door is closed. The alarm function is not operating. The theft deterrent system is not operating. The time until the system goes into the armed state. The theft deterrent system is operating. The alarm function is operating. If any of the doors are unlocked when the key is not in the key cylinder during the armed state, a forced door lock signal will be output (refer to Forced Door Lock Control). Informs driver of theft deterrent system status. Sounds when attempted break-in or theft is detected. Blink when attempted break-in or theft is detected. Come on when theft deterrent system has entered into alarm sounding state. Comes on when attempted break-in or theft is detected. Sound when attempted break-in or theft is detected. Detects door status (open or closed). Detects door status (locked or unlocked). Detects engine hood status (open or closed). Detects back door status (open or closed). Active arming mode starts the alarm control immediately after the doors are locked. This system operates as described in the diagram below when one of the items for each condition is met. The terms "all doors" and "any door" used in the following table include the back door. With all doors and engine hood closed, all doors are locked by key operation. With all doors and engine hood closed, all doors are locked by wireless operation. With all door lock position switches locked and engine hood closed, all doors are closed then. Allow approx. 30 seconds to elapse. All doors are unlocked by wireless operation. All doors are unlocked by key operation. The key is inserted into the ignition key cylinder. The ignition switch is turned to ON without using the key. The ignition switch is turned to ON and the engine is running for more than 2 seconds. After approx. 60 seconds, alarm stops and system returns to armed state. The engine hood is closed. With all doors closed and engine hood opened, all doors are locked by key operation. With all doors closed and engine hood opened, all doors are locked by wireless operation. With all door lock position switches locked and engine hood opened, all doors are closed then. Passive arming mode starts the alarm control after the key is removed from the key cylinder and the doors are closed. Passive arming mode can be switched ON/OFF using the Techstream. The alarm is initially set (when shipped from the factory) to active arming mode (not passive arming mode). During passive arming mode, the theft deterrent system goes into the armed state even if the doors are not locked. Detecting that the doors are unlocked does not set off the alarm during passive arming mode. A forced door lock signal is not output during passive arming mode (refer to Forced Door Lock Control). Although the theft deterrent system detects that the doors are opened during passive arming mode, the alarm will not go off immediately because an entry delay time is set. If condition  of active arming mode is met during passive arming mode, the theft deterrent system will switch to active arming mode. With the ignition switch off, any door is opened and then the key is removed from the ignition key cylinder. With the ignition switch off, the key is removed from the ignition key cylinder and then any door is opened. With engine hood closed, any door is closed. With all doors closed, the engine hood is closed. The ignition switch is turned to ON or ACC. Approx. 30 seconds elapse after condition  is met. Any door is opened and the entry delay time* elapse. All doors is unlocked by wireless operation. *: When any door is opened while all doors are closed during passive arming mode, the entry delay time starts. 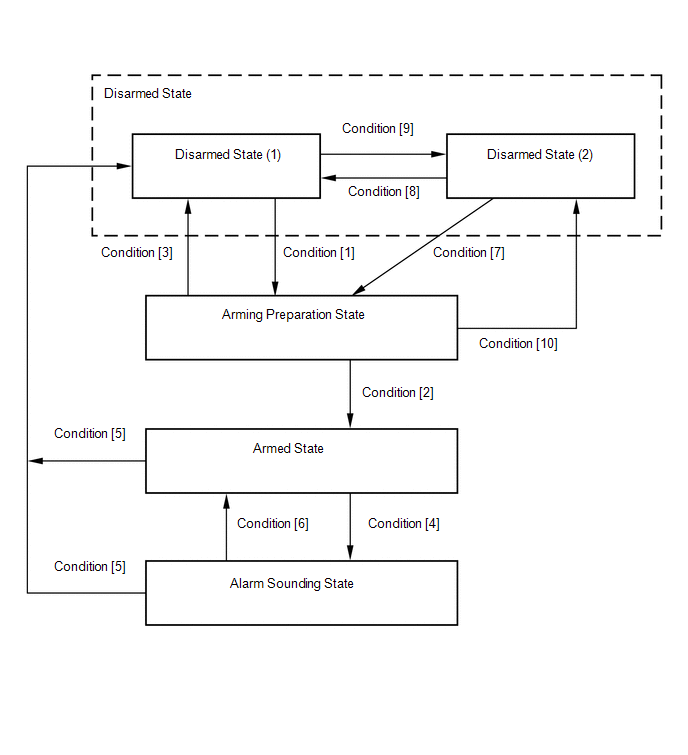 If the switch condition (armed state → disarmed state (1) or (2)) is met during the entry delay time, the theft deterrent system will return to disarmed state (1) or (2). However, if the switch condition for disarmed state (1) or (2) is not met, the theft deterrent system will recognize it as a theft and set off the alarm. Entry delay time of 0, 14 or 30 seconds can be selected by the customizing function. (a) The forced door lock control prevents the vehicle from being tampered with. Immediately after a door is unlocked (alarm starts), all doors are forced to lock by a forced door lock signal. The theft deterrent system is in the alarm sounding state of active arming mode. (a) If the alarm is set off (tampering is detected) while the theft deterrent system is armed, it will be stored by the alarm memory function. Whenever the theft deterrent system is canceled, the alarm memory function causes the taillights to light up for 2 seconds in order to inform you that the alarm has been set off. Switched to the disarmed state 1 from the armed state during active arming mode. 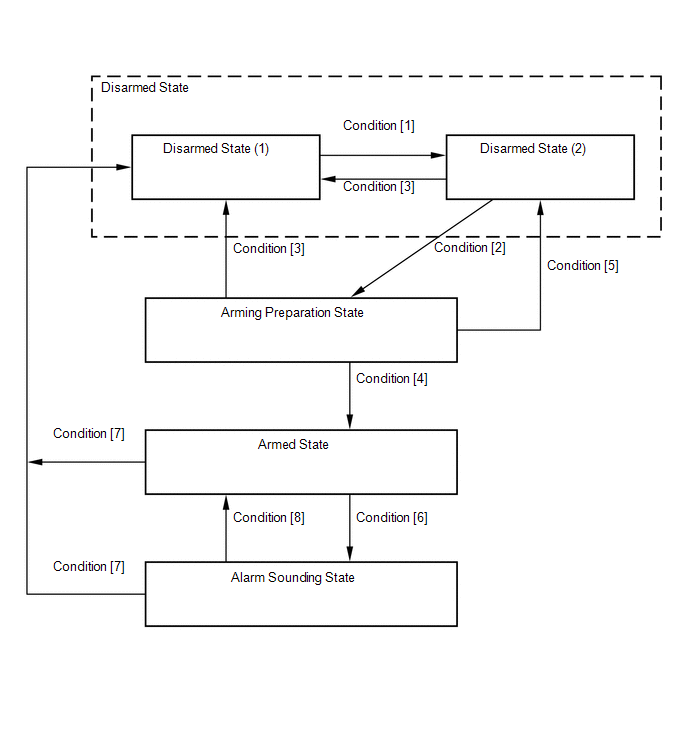 Switched to the disarmed state 1 from the armed state during passive arming mode. Active arming mode: See Active Arming Mode. Passive arming mode: See Passive Arming Mode. (a) The panic alarm control makes it possible to voluntarily set off the panic alarm by pressing the PANIC switch on the wireless transmitter. The PANIC switch is pressed again. Any of the switches on the wireless transmitter (LOCK/UNLOCK/POWER BACK DOOR) is pressed. The panic alarm ends (approx. 60 seconds have elapsed). (a) The main body ECU (driver side junction block assembly) outputs a signal to come on the security indicator, according to the state of the theft deterrent system. However, some of the actual lighting conditions of the security indicator are different from the output signals of the main body ECU (driver side junction block assembly). When the immobiliser system is set, the security indicator blinks during both the disarmed state and the armed state, due to output signals from the immobiliser system.